Lovelane Special Needs Horseback Riding Program focuses on children with special needs to enhance their lives and the lives of their families by providing life-long benefits, primarily through innovative therapeutic horseback riding. Lovelane is a 501(c)(3), non-profit organization and a member of Professional Association of Therapeutic Horsemanship (PATH) International. 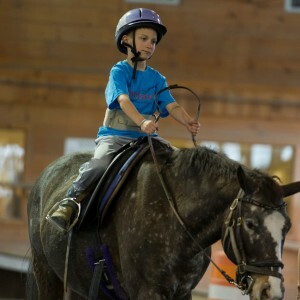 Lovelane has been providing high‐quality therapeutic horseback riding to children with special needs since 1988. What started as the ultimate grassroots organization – serving five families in a backyard barn – has grown into a premier equine therapeutic program in a state‐of‐the‐art indoor heated facility located in Lincoln, Massachusetts. Our organization believes in the significance of quality one‐on‐one support for each child. Our goal is to utilize the horse and this setting to make a significant impact on each child’s life beyond the riding ring. Lovelane’s state‐of‐the‐art facility is designed exclusively for children with special needs. Lessons are held in either the heated indoor or outdoor ring. Our facility includes an indoor family viewing room that brings families together while their children ride. Lovelane also has a sensory trail through the woods where students can ride and enjoy the opportunity to access nature.